Plastic containers are available in the most diverse designs, shapes, and materials and can be used in a wide variety of applications. These products of daily life are the result of continuous research and optimization; the requirements are constantly increasing. 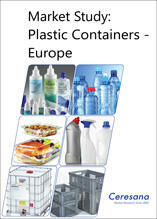 This study focuses on plastic containers. Bags or similar flexible packaging are not included in the market data. In many applications, plastics replace other materials such as glass or metal due to their many useful properties: Ceresana forecasts the European market of plastic containers to reach a volume of more than 12.4 million tonnes in 2024. PET packaging already reached high market shares in the segments CSD (carbonated soft drinks) and packaged water. Now, PET bottles and other containers also enter other segments, such as food, fruit juices, and household chemicals (e.g. detergents). Their positive properties are the reason for that: They weigh comparatively little, are recyclable, do not break, and offer high clarity. The gas barrier properties and protection against UV radiation continue to improve. Especially in the segment food, PET containers are a growth market. Thus, Ceresana’s analysts expect demand for PET containers in this segment, for example, in Poland to rise by an impressive 4.6 % per year. Chapter 1 analyzes demand, production, import, and export (in 1,000 tonnes) as well as revenues (in million US-dollar and million euro) in regard to plastic containers for 27 countries. Further, the study analyzes the demand for containers made of various types of plastics within the individual areas of application (e.g. PET containers in the segment food). Chapter 2: The application areas of plastic containers are described in detail: Data on consumption trends in the application areas lemonades, water, juices, other beverages, household chemicals, cosmetics & pharmaceuticals, food, and industry & transport.